Where can you find the best combination of music, food, and friends? Look no further than Alabama’s pub scene. The best pubs in Alabama offer way more than your typical bar experience. They’re the perfect place to grab a meal, kick back with friends new and old, sip on your favorite libations, and feel miles away from the everyday grind. Here are the best pubs in the state. This inviting brick-faced pub is one of the best places in town to grab a meal, but that’s not all it has going for it. Folks gather here on the regular for the nightly live music and low-priced beer specials. It’s also the best late night hangout for quality food and nearly 200 beer choices, including a hearty variety of craft brews. Keeping Florence funky, this little laidback hangout creates a fun experience every time you visit. Prices are reasonable, and fans swear they have the best pizza, hot dogs, and hot sandwiches in the city. It’s a bit cozy, especially during peak nightlife hours, but what they lack in space they more than make up for in ambiance and service. Their handcrafted beer exists alongside an award-worthy collection of craft beers from around the world. They’ve created a food menu that pairs perfectly with their brews to create the best possible combinations known to man. It’s a friendly place that knows how to make you feel at home. True to its name, this game-themed pub is a great place to enjoy a game, drink, or meal with friends. The atmosphere is arguably the most unique in the city, offering a fun blend of classic board games, gaming events, game-themed grub, and funky drinks. Nerds, geeks, and neither-of-the-above folks are all welcome here. Their award-winning burgers are only part of what they do best here. Having been serving up tasty eats and drinks since 1946, this place is a Mobile tradition that’s garnered thousands of “regulars.” They’ve got all your favorite pub classics, from burgers to chips and dips, as well as a simple yet succulent brunch menu. Known for their pizza, wings and sports-driven atmosphere, you can expect some of the best drink prices in town. They’ve got a mini arcade and pool tables to keep you motivated between games. It’s not just for college kids, either - most folks would agree that locals of all sorts have made this place their “home” bar. Not exactly in the sky, but this unique restaurant and bar will make you feel on top of the world. A rare find in Bham, this place takes a few pages from the playbooks of old, serving up a vintage atmosphere and experience that’s much like the old car-hop diners combined with a laid-back lounge look and feel. The end result is the perfect spot to grab a delicious meal, watch the big game, sip a new brew or wine, and enjoy an eclectic atmosphere unlike any other in the city. Dark wood paneled walls pair perfectly with bare brick facings to create the authentic pub vibe. They specialize in locally grown foods to create classic pub meals, like fish and chips or Shepherd’s pie. The decor is muted yet conversational, portions are generous, beer is cold, and the quick, friendly service will have you coming back for seconds. Ocean front views are reason enough to give this pub your business, but that’s just the beginning. Step inside to discover better-than-bar food like steaks and fresh seafood alongside classics like burgers and nachos. It’s a small place, but with its bright pink pony on its exterior it’ll be hard to miss—and even harder to pass up a chance to visit! 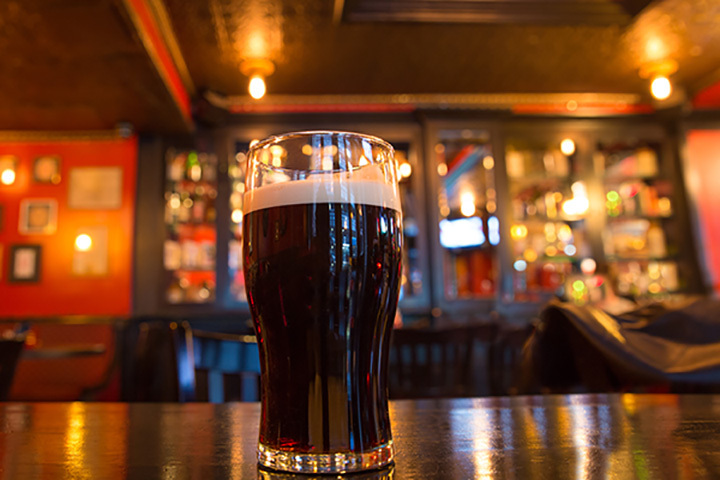 This traditional Irish pub is the next best thing to being in Ireland. Friendly to locals and travelers alike, you can expect a welcoming place for a meal or drinks, and even make a few new friends while you’re there. Fans rave about the wings, chicken bites and fast service, touting them as the best on the island.